Thank you for visiting Custom Garage Works! 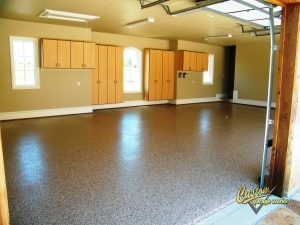 In 2003, we began offering high quality garage floor coating in Forney, TX after we needed more out of our own garages. We wanted to craft the ultimate garage, and when we couldn’t find what we wanted in the industry, we made the decision to create it ourselves. Presently speaking, we are proud to provide our clients with some of the best garage storage solutions on the market, as well as floor coatings that are stronger and more durable than traditional epoxy. We are passionate about fantastic garages, and while we began with a simple garage floor coating service, we are proud to provide many more custom garage solutions to the DFW area. Rising in popularity with each passing year, our garage floor coating in Forney, TX is among the best you’ll find in DFW. This boom in popularity is likely because our coatings are stronger than epoxy, and cure in a shorter amount of time, which means that you can use your garage within 24 hours in most scenarios. Thanks to the tough composition, our polyurea-based floor coating is resistant to changing color and flaking that can occur with epoxy. And due to our use of a diamond grinder instead of risky acid etching for floor preparation, we can offer a greater amount of adhesion, which leads to a better installation. Give us a call at 214-494-9068 or 817-308-1305 for your free estimate now, and we can tell you more about our premium garage floor coating service. Garage Floor Grinding Our method of diamond grinding is a more effective choice for of prepping your garage floor for coating. Epoxy Coatings Epoxy coatings are a common form of garage coating, but they aren’t the best option out there! And More! If you are looking for other garage floor choices, check here to see our other services! Thanks to Custom Garage Works’ storage solutions, you won’t ever need to worry about running out of space in your garage again. 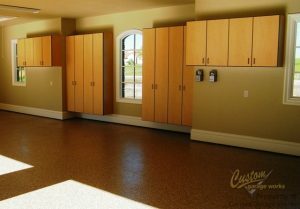 We recognize your new garage floor coating looks better when it isn’t covered by clutter! To address the unique organizational requirements of our customers, we offer a selection of different organization products, including overhead storage racks and cabinets. We provide some of the most resilient overhead storage racks in the industry, and our garage cabinets are specifically made for garage needs. We are committed to helping our clients obtain the perfect garage floor coating and organization for their requirements and budget, and we look forward to assisting you! Overhead Storage Racks When you need to get more out of your overhead storage space, our reliable storage racks are a fantastic place to start! Car Lifts Our car lifts help you keep your cars with style and accessibility, and they won’t scar your garage floors! And More! Our organization solutions are affordable and efficient ways to improve the look and feel of your garage.